Home offices with less-than-ideal workspaces. Antique desks that your grandfather made by hand. Cubicles the boss won't let you scrap in order to adapt into a standing desk workstation. There are endless reasons why your quest to secure a height adjustable desk can stop short. When you want options, we have the Front Clamp Standing Desk Converter by UPLIFT Desk. Task in a better way. This handy desk converter adjusts by way of a gas cylinder located in the main body, and uses just a single lever to reach your sitting and standing height preferences in seconds. An attachable tiered keyboard tray/mousing platform allows you to work in an ergonomically correct posture, and can be folded up when you don't need it to save space. If you're looking for a full sit-stand desk, click here. Why should I use a desk converter at my workstation? If you need more height adjustability in your workday, but are stuck with a traditional desk, a standing desk converter is an easy solution to get you standing. The Front Clamp Standing Desk Converter by UPLIFT Desk is a great ergonomic tool that allows you to create a standing desk at your current workstation, without requiring you to buy a whole new desk. Simply clamp the Front Clamp Standing Desk Converter onto the front edge of your old desk and enjoy better working postures from the first use! How does this work? Do I need a power outlet to use this converter? We love the Front Clamp Standing Desk Converter by UPLIFT Desk because of its simplicity, which lets you get back to business faster. This desk converter requires absolutely no power to use, and works by way of a handy gas cylinder within the main unit. As you might have figured out by its name, this desk converter installs on workstations by way of a reliable clamp mount, which lets you lower the converter's keyboard tray to desk level for ideal ergonomic positioning when seated. What makes this different from other standing desk converters? The Front Clamp Standing Desk Converter by UPLIFT Desk allows you to enjoy the benefits of a sit-stand workstation, without overhauling your current one. 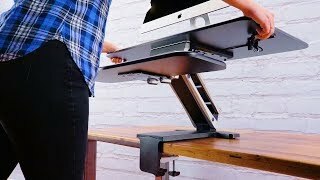 This converter differs from the XF Standing Desk Converter due to its design and expanded worksurface, and offers a slightly more compact converter than the Adapt Pogo Standing Desk Converter. Does this come with a keyboard tray? Yes, this ergo-friendly desk converter comes with a tiered keyboard tray and mousing platform that lets you type, mouse, and task in an ergonomically ideal position. The medium Front Clamp Standing Desk Converter by UPLIFT Desk features a wider workstation. Clamp the converter to the front of your desk and you will be enjoying the benefits of standing while you work in no time. The Front Clamp Standing Desk Converter is available in your choice of white or black. Add an UPLIFT Standing Desk Mat to provide more comfort while standing at your desk converter. Our 18" x 30" anti-fatigue mat has a gel foam core, providing comfort and support while you're standing at your UPLIFT Desk, and it's lightweight and easy to move aside when it's time to sit down. Order your desk by 3 pm Central on a business day and we guarantee your order will ship the same day. If placed after this time, your desk is guaranteed to ship the following business day. This product comes standard with a 2-year limited warranty. $239.00 List Price: $289.00* The list price is the same as the MSRP (Manufacturer's Suggested Retail Price). It may not necessarily be the price at which the product is sold.